Parents have the primary responsibility and privilege to provide the first Christian instruction and training for their child. 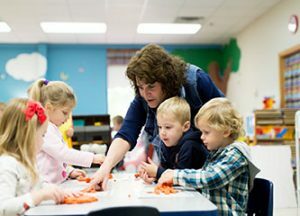 Peace Lutheran Preschool can strengthen and support parents in this responsibility by assisting and nurturing the child in his/her spiritual, intellectual, emotional, social, and physical needs. Here the children can learn to appreciate the goodness of God’s creation, recognize the need and love of their Savior, and feel the joy that comes from Christian living. Pre-registration is now open for the 2019-20 school year. A February 4th “Registration and Information” night is planned for 6:30 p.m. at school. Pre-registration is encouraged to secure your class choice. Call 262-673-3811 for more information. Looking for extended child care? Your child can attend Panther Care anytime during the week if he/she is enrolled in our preschool.